WiiWare has seen a surprising number of mini-game collections come its way, probably due to the simple nature of the genre and the greater likelihood of standing out as part of a weekly download release than on a store shelf crowded with such titles. 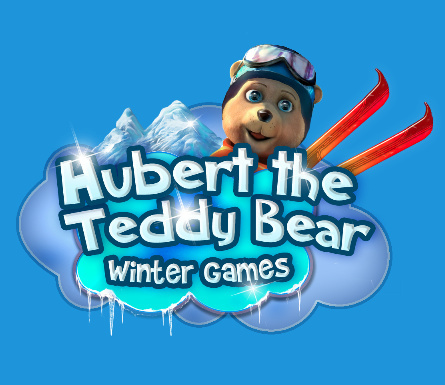 Hubert the Bear: Winter Games makes a decent addition to the genre as a party game experience that will likely be enjoyed by the under-10 crowd and their folks. After choosing a name and difficulty level you get to create your own teddy to use in the games, which is clearly a feature that youngsters will enjoy with all the options available. There's a surprisingly large number of skin templates (including the ever-popular panda) and loads of tops, trousers, hats (we like the one with ear flaps) and ski goggles. You can freely change your teddy's wardrobe later by going into the locker room, though the same cannot be said of your chosen difficulty setting unfortunately. This means increasing or decreasing handicaps (mostly taking the form of increased effort required in motion-based games) will necessitate deleting a profile and creating it again or making a new one. After your profiles are created you can jump right into the games. 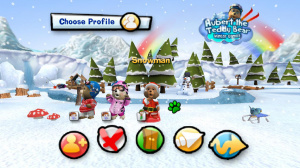 Whilst you can play any of the games in single or multiplayer modes (there's separate two player and "Party" modes), the multiplayer games will probably be more engaging for players due to the duration and nature of the games on offer: many are played to a time limit and consist of trying to get the high score on the local leaderboard rather than achieving a specific goal. One problem we noted when playing with multiple players is that there's no clear indicator showing you which profile belongs to which player: players click on the bear they want, but all of them are highlighted in red to show they're selected. With no regard to the colour of the player's cursor, this can make for a bit of confusion once the game starts if cursors aren't used! 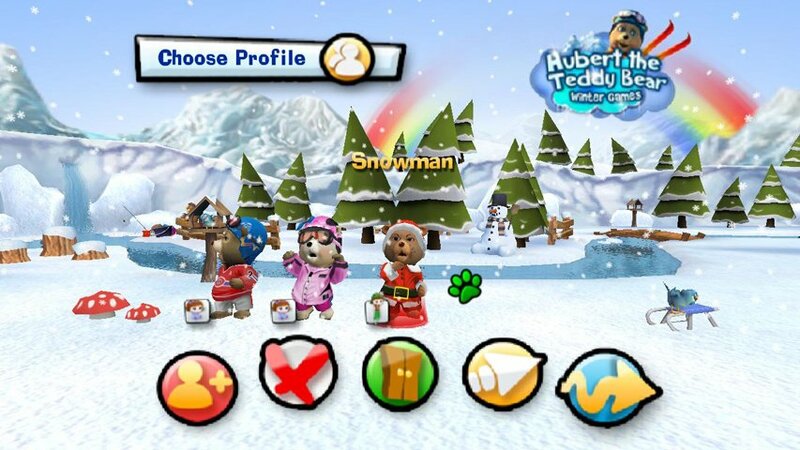 There's quite a bit of variety on offer: snowball throwing, sledge riding, a footrace, fishing (with your paws, naturally - these are bears after all), snowman building, Christmas tree decorating and a memory game like the classic electronic game Simon but with flashing icicles instead of buttons. Impressively the motion controls work pretty well, though some of the games have controls that seem a bit complicated or nonsensical, with the biggest offenders being snowball throwing and snowman building. In snowball throwing your object is to hit as many rabbits as possible within the time limit. Like most of the games in this collection both the Remote and Nunchuk are used: is held down to display a bullseye that is fixed in place when the button is released, after which you need to hold and then release it whilst making an overhand motion with the Nunchuk to throw your snowball at the target. Whilst this sounds, and is, a bit complicated you can achieve some impressive results, but we find it hard to imagine many kids in the target audience will be able to get to grips with this scheme that easily. Making a snowman involves tracing lines in a pattern, pressing repeatedly or waving the Remote when prompted. 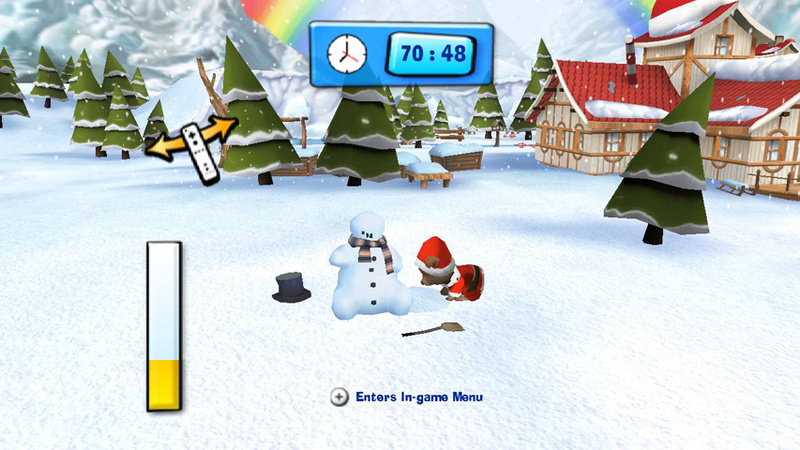 It's not that this is challenging (though upper difficulty levels are more likely to have patterns to trace and lower ones the waving/button pressing), but that the player's actions are completely divorced from the bear's actions in building a snowman and we'd like to think a better control scheme could have been implemented to make this game more interesting. Whilst the motions work well for the most part a few of events have minor issues, mostly relating to delays in detection of actions. The biggest offender is the footrace: you're supposed to chase down a rabbit thief laden with Christmas gifts using alternating Remote and Nunchuk movements that will be familiar to anyone who's played a mini-game collection before, raising both controllers together to jump over logs and pressing + together to duck under branches. Jumping requires cessation of motion for a second prior to your jump or the input won't be detected. This isn't a huge deal, but it breaks up the flow and could lead to frustration amongst enthusiastic players. The musical icicle game requires holding a button and making a motion to create the tones with a release of buttons between each one, slowing down the proceedings greatly and requiring a bit more patience from players. Lastly, Christmas tree decorating is rather particular about how long pressing is required before it registers that you're grabbing decorations to put on the highlighted part of the tree. 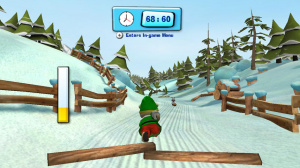 The other games have controls that are a bit easier to get to grips with: sledging after the rabbit dropping presents is little more than tilting a sideways Remote back-and-forth, with forward circular motions causing your bear to speed up (though there's no finish line so jockeying for position with other players in multiplayer games is the only reason you'd want to). Fishing just sees players swinging the Nunchuk or Remote to grasp fish and toss them into your bucket - depending on what side of the bear the fish are jumping from - with the option to hold a button when prompted to score extra points. 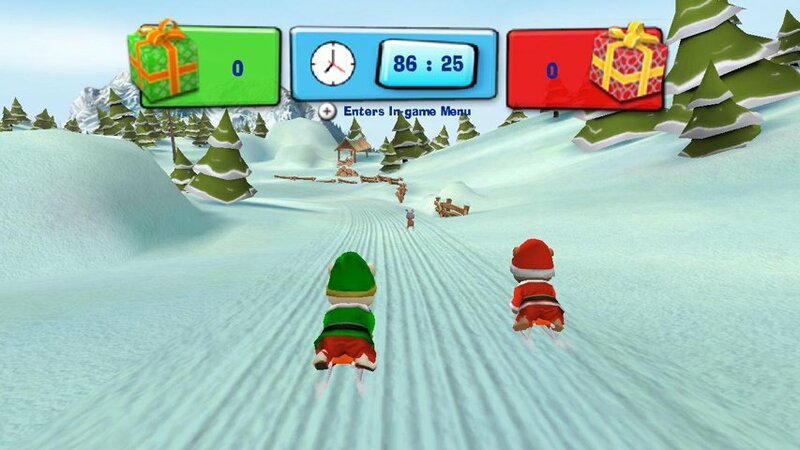 Running up a mountain to smash giant snowballs rolling towards you is played with the Nunchuk and alone whilst all the running and turning are done for you: players move the to change lanes on the mountain track and press to smash snowballs to get presents. Other than the issues highlighted this is a collection of games that plays pretty well, but won't necessarily be accessible to all ages due to varying levels of coordination required. Whilst the number of games implies a lot of bang for your buck, their limited duration and simplistic nature might limit long-term appeal and we think a "less is more" approach, featuring fewer games with deeper play mechanics and goals would have been a better development route. Still, if you're looking for a cheap game to entertain your kids this isn't a bad one to pick up and should provide some fun for the family. Meh, another crappy mini game collection for Wii. I'm trying to imagine Sean sitting there playing this one. I don't know why, but I find it amusing. This still is gonna be a big seller. Cute teddy bears and sports (like ACK said). Good job addressing some of the game's issues. Poor Sean. First Bloons, now this! By the way, great review. I have to confess the teddy bear customisation part is pretty cool. I kept thinking about how sparse the options were for decorating cards in the Happy Holidays programs by comparison. For adults there's not a lot here, though the snowball throwing is pretty fun and the downhill sledging was okay. I can see a bunch of kids at a sleepover having fun or a family with young children playing this, but then they might also have Mario Party, so I'm not sure how big the audience will be. Still, the budget price might work in their favour. 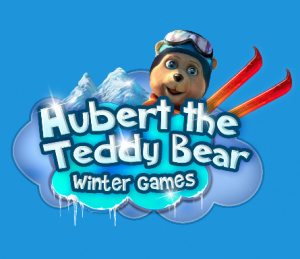 Incidentally I believe there's a Hubert the Teddy Bear: Tropical Holiday game on the PC which is also scheduled to come to WiiWare; no doubt I'll get tapped for that on the back of my previous experience! I can't believe you didn't mention the one song being repeated over and over throughout the entire game lol. I believe that the coolness would actually increase for the Winter Games.... Sorry, bad pun. Please don't throw rocks at me. @brooks83: True and I neglected to mention the "Scooby Doo" countdown before each match which was actually amusing or the bearly understandable audio samples in the menus which were a bit strange. Unfortunately something had to give and the review was already getting pretty big so I felt focus on gameplay was more important! Got it for my 2 girls ( 3 and 7 years old). Too bad the game had some problems for it to be average. I really considered getting this!